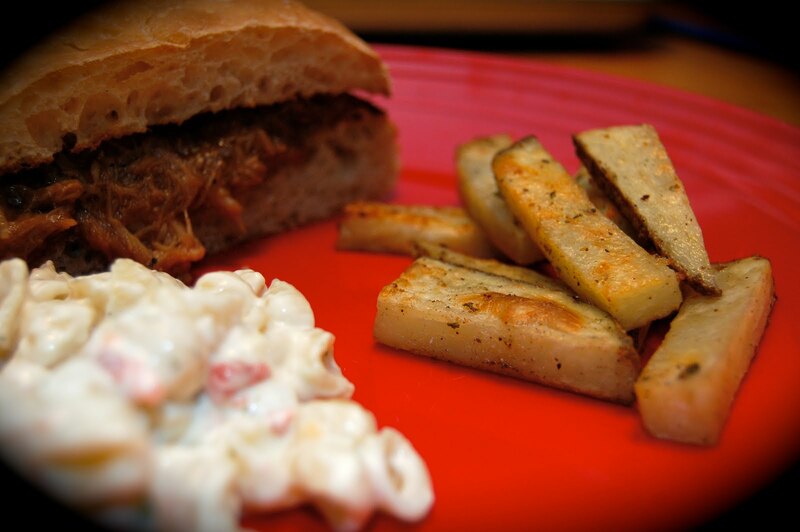 We finally had the pulled pork barbeque sandwiches tonight! We were supposed to have them Wednesday, but well, that didn’t happen. I served them with pasta salad and potato wedges. Mike told me tonight that everything was really good, but the potatoes were “the money” (in the words of Guy Fieri – Food Network chef with crazy white pointy hair and host of one of our fav shows, Diner’s Drive-Ins, & Dives). So, I decided to put up this recipe tonight. Preheat oven to 450 degrees. Wash and cut potatoes into desired length and thickness (I cut mine about 2 inches in length by about 1/2 in thick, but there was no real measurement!! I didn’t get my ruler out or anything…lol). In a medium bowl, mix the oil, house seasoning, and ranch. Add potatoes and stir to coat. Dump potatoes onto baking sheet coated with cooking spray. Bake for 25-35 minutes (stirring every 15 minutes) or until fork tender. If potatoes are not browned and crispy, switch oven to Broil and bake until desired crispiness. I also baked up a few Oatmeal Cookies because our dear friend, Chuck and his lovely new bride, Andrea, came over for a short visit after dinner. Chuck said, “I always make room for Shara’s Cookies!” He got “brownie” points for that! Hey girl…these were AWESOME!! Tried them tonite and we LOVED them. So, what else can we use Shara's seasoning for? I use it in place of regular salt & pepper on everything 😀 On hamburgers, roast, eggs, chicken, french fries, baked potatoes, etc…….